This article is about the class of sweet-flavored substances used as food. For common table sugar, see sucrose. For other uses, see sugar (disambiguation). "Lump sugar" redirects here. For the South Korean film, see Lump Sugar. Sugar is the generic name for sweet-tasting, soluble carbohydrates, many of which are used in food. The various types of sugar are derived from different sources. Simple sugars are called monosaccharides and include glucose (also known as dextrose), fructose, and galactose. "Table sugar" or "granulated sugar" refers to sucrose, a disaccharide of glucose and fructose. In the body, sucrose is hydrolysed into fructose and glucose. Sugars are found in the tissues of most plants, but sucrose is especially concentrated in sugarcane and sugar beet, making them ideal for efficient commercial extraction to make refined sugar. Sugarcane originated in tropical Indian subcontinent and Southeast Asia, and is known of from before 6,000 BP, sugar beet was first described in writing (1575) by Olivier de Serres and originated in southwestern, northern and Southeast Europe along the Atlantic coasts and the Mediterranean Sea, in North Africa, Macaronesia, to Western Asia. In 2016, the combined world production of those two crops was about two billion tonnes. Other disaccharides include maltose (from malted grain) and lactose (from milk). Longer chains of sugar molecules are called oligosaccharides or polysaccharides. Some other chemical substances, such as glycerol and sugar alcohols, may have a sweet taste, but are not classified as sugar. Sucrose is used in prepared foods (e.g. cookies and cakes), is sometimes added to commercially available beverages, and may be used by people as a sweetener for foods (e.g. toast and cereal) and beverages (e.g. coffee and tea). The average person consumes about 24 kilograms (53 lb) of sugar each year, or 33.1 kilograms (73 lb) in developed countries, equivalent to over 260 food calories per day. As sugar consumption grew in the latter part of the 20th century, researchers began to examine whether a diet high in sugar, especially refined sugar, was damaging to human health. Excessive consumption of sugar has been implicated in the onset of obesity, diabetes, cardiovascular disease, dementia, and tooth decay. Numerous studies have tried to clarify those implications, but with varying results, mainly because of the difficulty of finding populations for use as controls that consume little or no sugar. In 2015, the World Health Organization recommended that adults and children reduce their intake of free sugars to less than 10%, and encouraged a reduction to below 5%, of their total energy intake. The etymology reflects the spread of the commodity. From Sanskrit शर्करा (śarkarā), meaning "ground or candied sugar," originally "grit, gravel", came Persian shakar, whence Arabic سكر (sukkar), whence Medieval Latin succarum, whence 12th-century French sucre, whence the English word sugar. Italian zucchero, Spanish azúcar, and Portuguese açúcar came directly from Arabic, the Spanish and Portuguese words retaining the Arabic definite article. The earliest Greek word attested is σάκχαρις (sákkʰaris). The English word jaggery, a coarse brown sugar made from date palm sap or sugarcane juice, has a similar etymological origin: Portuguese jágara from the Malayalam ചക്കരാ (cakkarā), which is itself from the Sanskrit शर्करा (śarkarā). Sugar has been produced in the Indian subcontinent since ancient times and its cultivation spread from there into modern-day Afghanistan through the Khyber Pass. It was not plentiful or cheap in early times, and in most parts of the world, honey was more often used for sweetening. Originally, people chewed raw sugarcane to extract its sweetness. Sugarcane was a native of tropical Indian subcontinent and Southeast Asia. Different species seem to have originated from different locations with Saccharum barberi originating in India and S. edule and S. officinarum coming from New Guinea. One of the earliest historical references to sugarcane is in Chinese manuscripts dating to 8th century BCE, which state that the use of sugarcane originated in India. In the tradition of Indian medicine (āyurveda), the sugarcane is known by the name Ikṣu and the sugarcane juice is known as Phāṇita. Its varieties, synonyms and characterics are defined in nighaṇṭus such as the Bhāvaprakāśa (1.6.23, group of sugarcanes). Sugar remained relatively unimportant until the Indians discovered methods of turning sugarcane juice into granulated crystals that were easier to store and to transport. Crystallized sugar was discovered by the time of the Imperial Guptas, around the 5th century CE. In the local Indian language, these crystals were called khanda (Devanagari: खण्ड, Khaṇḍa), which is the source of the word candy. Indian sailors, who carried clarified butter and sugar as supplies, introduced knowledge of sugar along the various trade routes they travelled. Traveling Buddhist monks took sugar crystallization methods to China. During the reign of Harsha (r. 606–647) in North India, Indian envoys in Tang China taught methods of cultivating sugarcane after Emperor Taizong of Tang (r. 626–649) made known his interest in sugar. China established its first sugarcane plantations in the seventh century. Chinese documents confirm at least two missions to India, initiated in 647 CE, to obtain technology for sugar refining. In the Indian subcontinent, the Middle East and China, sugar became a staple of cooking and desserts. Nearchus, admiral of Alexander of Macedonia, knew of sugar during the year 325 B.C., because of his participation in the campaign of India led by Alexander (Arrian, Anabasis). The Greek physician Pedanius Dioscorides in the 1st century CE described sugar in his medical treatise De Materia Medica, and Pliny the Elder, a 1st-century CE Roman, described sugar in his Natural History: "Sugar is made in Arabia as well, but Indian sugar is better. It is a kind of honey found in cane, white as gum, and it crunches between the teeth. It comes in lumps the size of a hazelnut. Sugar is used only for medical purposes." Crusaders brought sugar back to Europe after their campaigns in the Holy Land, where they encountered caravans carrying "sweet salt". Early in the 12th century, Venice acquired some villages near Tyre and set up estates to produce sugar for export to Europe. It supplemented the use of honey, which had previously been the only available sweetener. Crusade chronicler William of Tyre, writing in the late 12th century, described sugar as "very necessary for the use and health of mankind". In the 15th century, Venice was the chief sugar refining and distribution center in Europe. In August 1492 Christopher Columbus stopped at La Gomera in the Canary Islands for wine and water, intending to stay only four days. He became romantically involved with the governor of the island, Beatriz de Bobadilla y Ossorio, and stayed a month. When he finally sailed, she gave him cuttings of sugarcane, which he carried to the New World. This was the introduction of this plant. The cuttings were planted and the first sugar-cane harvest in Hispaniola took place in 1501. Many sugar mills had been constructed in Cuba and Jamaica by the 1520s. The Portuguese took sugar cane to Brazil. By 1540, there were 800 cane-sugar mills in Santa Catarina Island and another 2,000 on the north coast of Brazil, Demarara, and Surinam. Sugar was a luxury in Europe until the 18th century, when it became more widely available. It became highly popular and by the 19th century, sugar came to be considered[by whom?] a necessity. This evolution of taste and demand for sugar as an essential food ingredient resulted in major economic and social changes. Demand drove, in part, the colonization of tropical islands and areas where labor-intensive sugarcane plantations and sugar manufacturing could be successful. The demand for cheap labor to perform the labor-intensive cultivation and processing increased the demand for the slave trade from Africa (in particular West Africa). After slavery was abolished, the demand for workers in the British Caribbean colonies was filled by indentured laborers from Indian subcontinent (in particular India). Millions of slave and indentured laborers were brought into the Caribbean and the Americas, Indian Ocean colonies, southeast Asia, Pacific Islands, and East Africa and Natal. Thus the modern ethnic mix of many nations that have been settled in the last two centuries has been influenced by the demand for sugar. Sugar also led to some industrialization of areas where sugar cane was grown. For example, in the 1790s Lieutenant J. Paterson, of the Bengal establishment, promoted to the British Government the idea that sugar cane could grow in British India, where it had started, with many advantages and at less expense than in the West Indies. As a result, sugar factories were established in Bihar in eastern India. During the Napoleonic Wars, sugar-beet production increased in continental Europe because of the difficulty of importing sugar when shipping was subject to blockade. By 1880 the sugar beet was the main source of sugar in Europe. It was also cultivated in Lincolnshire and other parts of England, although the United Kingdom continued to import the main part of its sugar from its colonies. Until the late nineteenth century, sugar was purchased in loaves, which had to be cut using implements called sugar nips. In later years, granulated sugar was more usually sold in bags. Sugar cubes were produced in the nineteenth century. The first inventor of a process to produce sugar in cube form was Moravian Jakub Kryštof Rad, director of a sugar company in Dačice. He began sugar-cube production after being granted a five-year patent for the process on January 23, 1843. Henry Tate of Tate & Lyle was another early manufacturer of sugar cubes at his refineries in Liverpool and London. Tate purchased a patent for sugar-cube manufacture from German Eugen Langen, who in 1872 had invented a different method of processing of sugar cubes. Sugar was rationed during World War I and more sharply during World War II. This led to the development and use of various artificial sweeteners. Sucrose: a disaccharide of glucose (left) and fructose (right), important molecules in the body. Monosaccharides in a closed-chain form can form glycosidic bonds with other monosaccharides, creating disaccharides (such as sucrose) and polysaccharides (such as starch). Enzymes must hydrolyze or otherwise break these glycosidic bonds before such compounds become metabolized. After digestion and absorption the principal monosaccharides present in the blood and internal tissues include glucose, fructose, and galactose. Many pentoses and hexoses can form ring structures. In these closed-chain forms, the aldehyde or ketone group remains non-free, so many of the reactions typical of these groups cannot occur. Glucose in solution exists mostly in the ring form at equilibrium, with less than 0.1% of the molecules in the open-chain form. Magnification of grains of refined sucrose, the most common free sugar. Because sugars burn easily when exposed to flame, the handling of sugars risks dust explosion. The risk of explosion is higher when the sugar has been milled to superfine texture, such as for use in chewing gum. The 2008 Georgia sugar refinery explosion, which killed 14 people and injured 40, and destroyed most of the refinery, was caused by the ignition of sugar dust. In its culinary use, exposing sugar to heat causes caramelization. As the process occurs, volatile chemicals such as diacetyl are released, producing the characteristic caramel flavor. Fructose, galactose, and glucose are all simple sugars, monosaccharides, with the general formula C6H12O6. They have five hydroxyl groups (−OH) and a carbonyl group (C=O) and are cyclic when dissolved in water. They each exist as several isomers with dextro- and laevo-rotatory forms that cause polarized light to diverge to the right or the left. Fructose, or fruit sugar, occurs naturally in fruits, some root vegetables, cane sugar and honey and is the sweetest of the sugars. It is one of the components of sucrose or table sugar. It is used as a high-fructose syrup, which is manufactured from hydrolyzed corn starch that has been processed to yield corn syrup, with enzymes then added to convert part of the glucose into fructose. Galactose generally does not occur in the free state but is a constituent with glucose of the disaccharide lactose or milk sugar. It is less sweet than glucose. It is a component of the antigens found on the surface of red blood cells that determine blood groups. Glucose, dextrose or grape sugar, occurs naturally in fruits and plant juices and is the primary product of photosynthesis. Most ingested carbohydrates are converted into glucose during digestion and it is the form of sugar that is transported around the bodies of animals in the bloodstream. Glucose syrup is a liquid form of glucose that is widely used in the manufacture of foodstuffs. It can be manufactured from starch by enzymatic hydrolysis. Lactose, maltose, and sucrose are all compound sugars, disaccharides, with the general formula C12H22O11. They are formed by the combination of two monosaccharide molecules with the exclusion of a molecule of water. Lactose is the naturally occurring sugar found in milk. A molecule of lactose is formed by the combination of a molecule of galactose with a molecule of glucose. It is broken down when consumed into its constituent parts by the enzyme lactase during digestion. Children have this enzyme but some adults no longer form it and they are unable to digest lactose. Maltose is formed during the germination of certain grains, the most notable being barley, which is converted into malt, the source of the sugar's name. A molecule of maltose is formed by the combination of two molecules of glucose. It is less sweet than glucose, fructose or sucrose. It is formed in the body during the digestion of starch by the enzyme amylase and is itself broken down during digestion by the enzyme maltase. Sucrose is found in the stems of sugarcane and roots of sugar beet. It also occurs naturally alongside fructose and glucose in other plants, in particular fruits and some roots such as carrots. The different proportions of sugars found in these foods determines the range of sweetness experienced when eating them. A molecule of sucrose is formed by the combination of a molecule of glucose with a molecule of fructose. After being eaten, sucrose is split into its constituent parts during digestion by a number of enzymes known as sucrases. The sugar contents of common fruits and vegetables are presented in Table 1. The fructose to fructose plus glucose ratio is calculated by including the fructose and glucose coming from the sucrose. ^A The carbohydrate figure is calculated in the USDA database and does not always correspond to the sum of the sugars, the starch, and the dietary fiber. Due to rising demand, sugar production in general increased some 14% over the period 2009 to 2018. The largest importers were China, Indonesia, and the United States. In 2016, global production of sugar beets was 277 million tonnes, led by Russia with 19% of the world total (table). The sugar beet became a major source of sugar in the 19th century when methods for extracting the sugar became available. It is a biennial plant, a cultivated variety of Beta vulgaris in the family Amaranthaceae, the tuberous root of which contains a high proportion of sucrose. It is cultivated as a root crop in temperate regions with adequate rainfall and requires a fertile soil. The crop is harvested mechanically in the autumn and the crown of leaves and excess soil removed. The roots do not deteriorate rapidly and may be left in the field for some weeks before being transported to the processing plant where the crop is washed and sliced, and the sugar extracted by diffusion. Milk of lime is added to the raw juice with calcium carbonate. After water is evaporated by boiling the syrup under a vacuum, the syrup is cooled and seeded with sugar crystals. The white sugar that crystallizes can be separated in a centrifuge and dried, requiring no further refining. Global production of sugarcane in 2016 was 1.9 billion tonnes, with Brazil producing 41% of the world total and India 18% (table). Sugarcane refers to any of several species, or their hybrids, of giant grasses in the genus Saccharum in the family Poaceae. They have been cultivated in tropical climates in the Indian subcontinent and Southeast Asia over centuries for the sucrose found in their stems. A great expansion in sugarcane production took place in the 18th century with the establishment of slave plantations in the Americas. The use of slavery for the labor-intensive process resulted in sugar production, enabling prices cheap enough for most people to buy. Mechanization reduced some labor needs, but in the 21st century, cultivation and production relied on low-wage laborers. Sugar cane requires a frost-free climate with sufficient rainfall during the growing season to make full use of the plant's substantial growth potential. The crop is harvested mechanically or by hand, chopped into lengths and conveyed rapidly to the processing plant (commonly known as a sugar mill) where it is either milled and the juice extracted with water or extracted by diffusion. The juice is clarified with lime and heated to destroy enzymes. The resulting thin syrup is concentrated in a series of evaporators, after which further water is removed. The resulting supersaturated solution is seeded with sugar crystals, facilitating crystal formation and drying. Molasses is a by-product of the process and the fiber from the stems, known as bagasse, is burned to provide energy for the sugar extraction process. The crystals of raw sugar have a sticky brown coating and either can be used as they are, can be bleached by sulfur dioxide, or can be treated in a carbonatation process to produce a whiter product. About 2,500 litres (660 US gal) of irrigation water is needed for every one kilogram (2.2 pounds) of sugar produced. Refined sugar is made from raw sugar that has undergone a refining process to remove the molasses. Raw sugar is sucrose which is extracted from sugarcane or sugar beet. While raw sugar can be consumed, the refining process removes unwanted tastes and results in refined sugar or white sugar. The sugar may be transported in bulk to the country where it will be used and the refining process often takes place there. The first stage is known as affination and involves immersing the sugar crystals in a concentrated syrup that softens and removes the sticky brown coating without dissolving them. The crystals are then separated from the liquor and dissolved in water. The resulting syrup is treated either by a carbonatation or by a phosphatation process. Both involve the precipitation of a fine solid in the syrup and when this is filtered out, many of the impurities are removed at the same time. Removal of color is achieved by using either a granular activated carbon or an ion-exchange resin. The sugar syrup is concentrated by boiling and then cooled and seeded with sugar crystals, causing the sugar to crystallize out. The liquor is spun off in a centrifuge and the white crystals are dried in hot air and ready to be packaged or used. The surplus liquor is made into refiners' molasses. The International Commission for Uniform Methods of Sugar Analysis sets standards for the measurement of the purity of refined sugar, known as ICUMSA numbers; lower numbers indicate a higher level of purity in the refined sugar. Refined sugar is widely used for industrial needs for higher quality. Refined sugar is purer (ICUMSA below 300) than raw sugar (ICUMSA over 1,500). The level of purity associated with the colors of sugar, expressed by standard number ICUMSA, the smaller ICUMSA numbers indicate the higher purity of sugar. 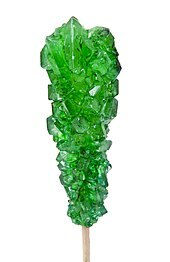 Rock candy crystallized out of a supersaturated sugar solution that contains green dye. Brown sugars are granulated sugars, either containing residual molasses, or with the grains deliberately coated with molasses to produce a light- or dark-colored sugar. They are used in baked goods, confectionery, and toffees. Granulated sugars are used at the table, to sprinkle on foods and to sweeten hot drinks (coffee and tea), and in home baking to add sweetness and texture to baked products (cookies and cakes) and desserts (pudding and ice cream). They are also used as a preservative to prevent micro-organisms from growing and perishable food from spoiling, as in candied fruits, jams, and marmalades. Invert sugars and syrups are blended to manufacturers specifications and are used in breads, cakes, and beverages for adjusting sweetness, aiding moisture retention and avoiding crystallization of sugars. Liquid sugars are strong syrups consisting of 67% granulated sugar dissolved in water. They are used in the food processing of a wide range of products including beverages, hard candy, ice cream, and jams. Low-calorie sugars and artificial sweeteners are often made of maltodextrin with added sweeteners. Maltodextrin is an easily digestible synthetic polysaccharide consisting of short chains of glucose molecules and is made by the partial hydrolysis of starch. Milled sugars (known as confectioner's sugar and powdered sugar) are ground to a fine powder. They are used as powdered sugar (also known as icing sugar or confectionary sugar), for dusting foods and in baking and confectionery. Molasses is commonly used to make rum, and sugar byproducts are used to make ethanol for fuel. Polyols are sugar alcohols and are used in chewing gums where a sweet flavor is required that lasts for a prolonged time in the mouth. Screened sugars are crystalline products separated according to the size of the grains. They are used for decorative table sugars, for blending in dry mixes and in baking and confectionery. Sugar cubes(de) (sometimes called sugar lumps) are white or brown granulated sugars lightly steamed and pressed together in block shape. They are used to sweeten drinks. Sugarloaf was the usual cone-form in which refined sugar was produced and sold until the late 19th century. This shape is still in use in Germany (for preparation of Feuerzangenbowle) as well as Iran and Morocco. Syrups and treacles are dissolved invert sugars heated to develop the characteristic flavors. (Treacles have added molasses.) They are used in a range of baked goods and confectionery including toffees and licorice. In winemaking, fruit sugars are converted into alcohol by a fermentation process. If the must formed by pressing the fruit has a low sugar content, additional sugar may be added to raise the alcohol content of the wine in a process called chaptalization. In the production of sweet wines, fermentation may be halted before it has run its full course, leaving behind some residual sugar that gives the wine its sweet taste. In most parts of the world, sugar is an important part of the human diet, making food more palatable and providing food energy. After cereals and vegetable oils, sugar derived from sugarcane and beet provided more kilocalories per capita per day on average than other food groups. According to one source, per capita consumption of sugar in 2016 was highest in the United States, followed by Germany and the Netherlands. Brown and white granulated sugar are 97% to nearly 100% carbohydrates, respectively, with less than 2% water, and no dietary fiber, protein or fat (table). Brown sugar contains a moderate amount of iron (15% of the Reference Daily Intake in a 100 gram amount, see table), but a typical serving of 4 grams (one teaspoon), would provide 15 calories and a negligible amount of iron or any other nutrient. Because brown sugar contains 5–10% molasses reintroduced during processing, its value to some consumers is a richer flavor than white sugar. Sugar refiners and manufacturers of sugary foods and drinks have sought to influence medical research and public health recommendations, with substantial and largely clandestine spending documented from the 1960s to 2016. The results of research on the health effects of sugary food and drink differ significantly, depending on whether the researcher has financial ties to the food and drink industry. A 2013 medical review concluded that "unhealthy commodity industries should have no role in the formation of national or international NCD [non-communicable disease] policy". There have been similar efforts to steer coverage of sugar-related health information in popular media, including news media and social media. A 2003 World Health Organization technical report provided evidence that high intake of sugary drinks (including fruit juice) increased the risk of obesity by adding to overall energy intake. By itself, sugar is not a factor causing obesity and metabolic syndrome, but rather – when over-consumed – is a component of unhealthy dietary behavior. Meta-analyses showed that excessive consumption of sugar-sweetened beverages increased the risk of developing type 2 diabetes and metabolic syndrome – including weight gain and obesity – in adults and children. A 2018 systematic review concluded that the potential for sugar addiction was greater when in combination with dietary fats. Some studies report evidence of causality between high consumption of refined sugar and hyperactivity. One review of low-quality studies of children consuming high amounts of energy drinks showed association with higher rates of unhealthy behaviors, including smoking and alcohol abuse, and with hyperactivity and insomnia. The 2003 WHO report stated that "Sugars are undoubtedly the most important dietary factor in the development of dental caries". A review of human studies showed that the incidence of caries is lower when sugar intake is less than 10% of total energy consumed. The "empty calories" argument states that a diet high in added sugar will reduce consumption of foods that contain essential nutrients. This nutrient displacement occurs if sugar makes up more than 25% of daily energy intake, a proportion associated with poor diet quality and risk of obesity. Displacement may occur at lower levels of consumption. Claims have been made of a sugar–Alzheimer's disease connection, but there is inconclusive evidence that cognitive decline is related to dietary fructose or overall energy intake. The World Health Organization recommends that both adults and children reduce the intake of free sugars to less than 10% of total energy intake, and suggests a reduction to below 5%. "Free sugars" include monosaccharides and disaccharides added to foods, and sugars found in fruit juice and concentrates, as well as in honey and syrups. According to the WHO, "[t]hese recommendations were based on the totality of available evidence reviewed regarding the relationship between free sugars intake and body weight (low and moderate quality evidence) and dental caries (very low and moderate quality evidence)." On May 20, 2016, the U.S. Food and Drug Administration announced changes to the Nutrition Facts panel displayed on all foods, to be effective by July 2018. New to the panel is a requirement to list "Added sugars" by weight and as a percent of Daily Value (DV). For vitamins and minerals, the intent of DVs is to indicate how much should be consumed. For added sugars, the guidance is that 100% DV should not be exceeded. 100% DV is defined as 50 grams. For a person consuming 2000 calories a day, 50 grams is equal to 200 calories and thus 10% of total calories—the same guidance as the World Health Organization. To put this in context, most 12 ounce (335 mL) cans of soda contain 39 grams of sugar. In the United States, a government survey on food consumption in 2013–2014 reported that, for men and women aged 20 and older, the average total sugar intakes—naturally occurring in foods and added—were, respectively, 125 and 99 g/day. Various culinary sugars have different densities due to differences in particle size and inclusion of moisture. Manufacturers of sugary products, such as soft drinks and candy, and the Sugar Research Foundation have been accused of trying to influence consumers and medical associations in the 1960s and 1970s by creating doubt about the potential health hazards of sucrose overconsumption, while promoting saturated fat as the main dietary risk factor in cardiovascular diseases. In 2016, the criticism led to recommendations that diet policymakers emphasize the need for high-quality research that accounts for multiple biomarkers on development of cardiovascular diseases. ^ a b c d e Roy Moxham (7 February 2002). The Great Hedge of India: The Search for the Living Barrier that Divided a People. Basic Books. ISBN 978-0-7867-0976-2. ^ a b "Guideline: Sugar intake for adults and children" (PDF). Geneva: World Health Organization. 2015: 4. Archived (PDF) from the original on July 4, 2018. ^ a b Harper, Douglas. "Sugar". Online Etymology Dictionary. ^ "Jaggery". Oxford Dictionaries. Retrieved 2012-08-17. ^ Gordon, Stewart (2008). When Asia was the World. Da Capo Press. p. 12. ^ a b Kiple, Kenneth F. & Kriemhild Conee Ornelas. World history of Food – Sugar. Cambridge University Press. Retrieved 9 January 2012. ^ a b Rolph, George (1873). Something about sugar: its history, growth, manufacture and distribution. San Francisco: J.J. Newbegin. ^ Murthy, K.R. Srikantha (2016). Bhāvaprakāśa of Bhāvamiśra, Vol. I. Krishnadas Ayurveda Series 45 (reprint 2016 ed.). Chowkhamba Krishnadas Academy, Varanasi. pp. 490–94. ISBN 978-81-218-0000-6. ^ a b c Adas, Michael (January 2001). Agricultural and Pastoral Societies in Ancient and Classical History. Temple University Press. ISBN 1-56639-832-0. p. 311. ^ "Sugarcane: Saccharum Officinarum" (PDF). USAID, Govt of United States. 2006. p. 7.1. Archived from the original (PDF) on 2013-11-06. ^ Kieschnick, John (2003). The Impact of Buddhism on Chinese Material Culture Princeton University Press. ISBN 0-691-09676-7. ^ Sen, Tansen. (2003). Buddhism, Diplomacy, and Trade: The Realignment of Sino-Indian Relations, 600–1400. Manoa: Asian Interactions and Comparisons, a joint publication of the University of Hawaii Press and the Association for Asian Studies. ISBN 0-8248-2593-4. pp. 38–40. ^ Kieschnick, John (2003). The Impact of Buddhism on Chinese Material Culture Princeton University Press. 258. ISBN 0-691-09676-7. ^ "There is a kind of coalesced honey called sakcharon [i.e. sugar] found in reeds in India and Eudaimon Arabia similar in consistency to salt and brittle enough to be broken between the teeth like salt," Quoted from Book Two of Dioscorides' Materia Medica. The book is downloadable from links at the Wikipedia Dioscorides page. ^ Ponting, Clive (2000) . World history: a new perspective. London: Chatto & Windus. p. 481. ISBN 978-0-7011-6834-6. ^ Barber, Malcolm (2004). The two cities: medieval Europe, 1050–1320 (2nd ed.). Routledge. p. 14. ISBN 978-0-415-17415-2. ^ Benitez-Rojo 1996, p. 93. ^ Mintz, Sidney (1986). Sweetness and Power: The Place of Sugar in Modern History. Penguin. ISBN 978-0-14-009233-2. ^ "Forced Labour". The National Archives, Government of the United Kingdom. 2010. ^ Lai, Walton (1993). Indentured labor, Caribbean sugar: Chinese and Indian migrants to the British West Indies, 1838–1918. ISBN 978-0-8018-7746-9. ^ Vertovik, Steven; (Robin Cohen, ed.) (1995). The Cambridge survey of world migration. pp. 57–68. ISBN 978-0-521-44405-7. ^ Laurence, K (1994). A Question of Labour: Indentured Immigration Into Trinidad & British Guiana, 1875–1917. St Martin's Press. ISBN 978-0-312-12172-3. ^ "St. Lucia's Indian Arrival Day". Caribbean Repeating Islands. 2009. ^ "Indian indentured labourers". The National Archives, Government of the United Kingdom. 2010. ^ Early Sugar Industry of Bihar – Bihargatha Archived 2011-09-10 at the Wayback Machine. Bihargatha.in. Retrieved on 2012-01-07. ^ Compare: Bosma, Ulbe (2013). The Sugar Plantation in India and Indonesia: Industrial Production, 1770–2010. Studies in Comparative World History. Cambridge University Press. ISBN 978-1-107-43530-8. Retrieved 2018-09-03. ^ "How Sugar is Made – the History". SKIL: Sugar Knowledge International. Retrieved 2012-03-28. ^ "A Visit to the Tate & Lyle Archive". The Sugar Girls blog. 10 March 2012. Retrieved 2012-03-11. ^ Barrett, Duncan & Nuala Calvi (2012). The Sugar Girls. Collins. p. ix. ISBN 978-0-00-744847-0. ^ a b Hicks, Jesse (Spring 2010). "The Pursuit of Sweet". Science History Institute. ^ "1953: Sweet rationing ends in Britain". BBC. 5 February 1953. ^ Nilsson, Jeff (May 5, 2017). "Could You Stomach America's Wartime Sugar Ration? 75 Years Ago". Saturday Evening Post. ^ Lee, K. (1946). "Sugar Supply". CQ Press. Retrieved 28 October 2018. ^ "Rationing of food and clothing during the Second World War". The Australian War Memorial. October 25, 2017. ^ Ur-Rehman, S; Mushtaq, Z; Zahoor, T; Jamil, A; Murtaza, MA (2015). "Xylitol: a review on bioproduction, application, health benefits, and related safety issues". Critical Reviews in Food Science and Nutrition. 55 (11): 1514–28. doi:10.1080/10408398.2012.702288. PMID 24915309. ^ a b c Pigman, Ward; Horton, D. (1972). Pigman and Horton (ed.). The Carbohydrates: Chemistry and Biochemistry Vol 1A (2nd ed.). San Diego: Academic Press. pp. 1–67. ISBN 978-0-12-556352-9. ^ Joshi, S; Agte, V (1995). "Digestibility of dietary fiber components in vegetarian men". Plant Foods for Human Nutrition (Dordrecht, Netherlands). 48 (1): 39–44. doi:10.1007/BF01089198. PMID 8719737. ^ The Merck Index: An Encyclopedia of Chemicals, Drugs, and Biologicals (11th ed. ), Merck, 1989, ISBN 091191028X , 8205. ^ Edwards, William P. (9 November 2015). The Science of Sugar Confectionery. Royal Society of Chemistry. p. 120. ISBN 978-1-78262-609-1. ^ a b c d Buss, David; Robertson, Jean (1976). Manual of Nutrition; Ministry of Agriculture, Fisheries and Food. London: Her Majesty's Stationery Office. pp. 5–9. ^ Kretchmer, Norman; Claire B. Hollenbeck (1991). Sugars and Sweeteners. CRC Press, Inc. ISBN 978-0-8493-8835-4. ^ Raven, Peter H. & George B. Johnson (1995). Carol J. Mills (ed.). Understanding Biology (3rd ed.). WM C. Brown. p. 203. ISBN 978-0-697-22213-8. ^ Schenck, Fred W. (2006). "Glucose and Glucose-Containing Syrups". Ullmann's Encyclopedia of Industrial Chemistry. Wiley-VCH, Weinheim. doi:10.1002/14356007.a12_457.pub2. ^ "Lactase". Encyclopædia Britannica Online. ^ "Maltase". Encyclopædia Britannica Online. ^ "Sucrase". Encyclopædia Britannica Online. ^ "Sugar beet production in 2016, Crops/Regions/World list/Production Quantity (pick lists)". UN Food and Agriculture Organization, Corporate Statistical Database (FAOSTAT). 2017. Retrieved 20 May 2018. ^ a b "Sugar: World Markets and Trade" (PDF). Foreign Agricultural Service, US Department of Agriculture. November 2017. Retrieved 20 May 2018. ^ "Biennial beet". GMO Compass. Archived from the original on 2014-02-02. Retrieved 2014-01-26. ^ a b "How Beet Sugar is Made". Sugar Knowledge International. Retrieved 2012-03-22. ^ "Sugarcane production in 2016, Crops/Regions/World list/Production Quantity (pick lists)". UN Food and Agriculture Organization, Corporate Statistical Database (FAOSTAT). 2017. Retrieved 20 May 2018. ^ a b c d "How Cane Sugar is Made - the Basic Story". Sugar Knowledge International. Retrieved 24 September 2018. ^ Flynn, Kerry (April 23, 2016). "India Drought 2016 May Lead 29–35% Drop In Sugar Output For 2016–17 Season: Report". International Business Times. Retrieved October 27, 2016. ^ "Tantangan Menghadapi Ketergantungan Impor Gula Rafinasi" (in Indonesian). Asosiasi Gula Rafinasi Indonesia. Retrieved 9 April 2014. ^ "Rafinasi Vs Gula Kristal Putih" (in Indonesian). Kompas Gramedia. 2011-07-29. Retrieved 9 April 2014. ^ Pakpahan, Agus; Supriono, Agus, eds. (2005). "Bagaimana Gula Dimurnikan – Proses Dasar". Ketika Tebu Mulai Berbunga (in Indonesian). Bogor: Sugar Observer. ISBN 978-979-99311-0-8. ^ "How Sugar is Refined". SKIL. Retrieved 2012-03-22. ^ Deulgaonkar, Atul (March 12–25, 2005). "A case for reform". Frontline. 22 (8). Archived from the original on 2011-07-28. ^ a b Pakpahan, Agus; Supriono, Agus, eds. (2005). "Industri Rafinasi Kunci Pembuka Restrukturisasi Industri Gula Indonesia". Ketika Tebu Mulai Berbunga (in Indonesian). Bogor: Sugar Observer. pp. 70–72. ISBN 978-979-99311-0-8. ^ a b c d e f g "The journey of sugar". British Sugar. Archived from the original on 2011-03-26. Retrieved 2012-03-23. ^ "Types and uses". Sugar Nutrition UK. Retrieved 2012-03-23. ^ Hofman, D. L; Van Buul, V. J; Brouns, F. J (2015). "Nutrition, Health, and Regulatory Aspects of Digestible Maltodextrins". Critical Reviews in Food Science and Nutrition. 56 (12): 2091–2100. doi:10.1080/10408398.2014.940415. PMC 4940893. PMID 25674937. ^ European Parliament and Council (1990). "Council Directive on nutrition labelling for foodstuffs". Council Directive of 24 September 1990 on nutrition labelling for foodstuffs. p. 4. Retrieved 2011-09-28. ^ Robinson, Jancis (2006). The Oxford Companion to Wine (3rd ed.). Oxford University Press. pp. 665–66. ISBN 978-0-19-860990-2. ^ "Food Balance Sheets". Food and Agriculture Organization of the United Nations. 2007. ^ Amber Pariona (25 April 2017). "Top Sugar Consuming Nations In The World". World Atlas. Retrieved 20 May 2018. ^ "Sugars, granulated (sucrose) in 4 grams (from pick list)". Conde Nast for the USDA National Nutrient Database, version SR-21. 2014. Retrieved 13 May 2017. ^ O'Connor, Anahad (12 June 2007). "The Claim: Brown Sugar Is Healthier Than White Sugar". The New York Times. Retrieved 13 May 2017. ^ Mozaffarian, Dariush (2017-05-02). "Conflict of Interest and the Role of the Food Industry in Nutrition Research". JAMA. 317 (17): 1755–56. doi:10.1001/jama.2017.3456. ISSN 0098-7484. PMID 28464165. ^ Anderson, P.; Miller, D. (2015-02-11). "Commentary: Sweet policies" (PDF). BMJ. 350 (feb10 16): 780–h780. doi:10.1136/bmj.h780. ISSN 1756-1833. PMID 25672619. ^ a b c Kearns, C. E.; Schmidt, L. A; Glantz, S. A (2016). "Sugar Industry and Coronary Heart Disease Research: A Historical Analysis of Internal Industry Documents". JAMA Internal Medicine. 176 (11): 1680–85. doi:10.1001/jamainternmed.2016.5394. PMC 5099084. PMID 27617709. ^ Kearns, Cristin E.; Glantz, Stanton A.; Schmidt, Laura A. (2015-03-10). Simon Capewell (ed.). "Sugar Industry Influence on the Scientific Agenda of the National Institute of Dental Research's 1971 National Caries Program: A Historical Analysis of Internal Documents". PLOS Medicine. 12 (3): 1001798. doi:10.1371/journal.pmed.1001798. ISSN 1549-1676. PMC 4355299. PMID 25756179. ^ Aaron, Daniel G.; Siegel, Michael B. (January 2017). "Sponsorship of National Health Organizations by Two Major Soda Companies". American Journal of Preventive Medicine. 52 (1): 20–30. doi:10.1016/j.amepre.2016.08.010. ISSN 0749-3797. PMID 27745783. ^ Bes-Rastrollo, Maira; Schulze, Matthias B.; Ruiz-Canela, Miguel; Martinez-Gonzalez, Miguel A. (2013). "Financial conflicts of interest and reporting bias regarding the association between sugar-sweetened beverages and weight gain: a systematic review of systematic reviews". PLoS Medicine. 10 (12): 1001578. doi:10.1371/journal.pmed.1001578. PMC 3876974. PMID 24391479. ^ O’Connor, Anahad (2016-10-31). "Studies Linked to Soda Industry Mask Health Risks". The New York Times. ISSN 0362-4331. Retrieved 2018-03-23. ^ Moodie, Rob; Stuckler, David; Monteiro, Carlos; Sheron, Nick; Neal, Bruce; Thamarangsi, Thaksaphon; Lincoln, Paul; Casswell, Sally (2013-02-23). "Profits and pandemics: prevention of harmful effects of tobacco, alcohol, and ultra-processed food and drink industries". The Lancet. 381 (9867): 670–79. doi:10.1016/S0140-6736(12)62089-3. ISSN 0140-6736. PMID 23410611. ^ O’Connor, Anahad (2015-08-09). "Coca-Cola Funds Scientists Who Shift Blame for Obesity Away From Bad Diets". Well. Retrieved 2018-03-24. ^ Lipton, Eric (2014-02-11). "Rival Industries Sweet-Talk the Public". The New York Times. ISSN 0362-4331. Retrieved 2018-03-23. ^ Sifferlin, Alexandra (2016-10-10). "Soda Companies Fund 96 Health Groups In the U.S." Time. Retrieved 2018-03-24. ^ a b c Joint WHO/FAO Expert Consultation (2003). "WHO Technical Report Series 916: Diet, Nutrition and the Prevention of Chronic Diseases" (PDF). Retrieved 2013-12-25. ^ Malik, V. S.; Popkin, B. M.; Bray, G. A.; Despres, J.-P.; Willett, W. C.; Hu, F. B. (2010). "Sugar-Sweetened Beverages and Risk of Metabolic Syndrome and Type 2 Diabetes: A meta-analysis". Diabetes Care. 33 (11): 2477–83. doi:10.2337/dc10-1079. PMC 2963518. PMID 20693348. ^ Malik, Vasanti S.; Pan, An; Willett, Walter C.; Hu, Frank B. (2013-10-01). "Sugar-sweetened beverages and weight gain in children and adults: a systematic review and meta-analysis". The American Journal of Clinical Nutrition. 98 (4): 1084–1102. doi:10.3945/ajcn.113.058362. ISSN 0002-9165. PMC 3778861. PMID 23966427. ^ Gordon EL, Ariel-Donges AH, Bauman V, Merlo LJ (April 2018). "What Is the Evidence for "Food Addiction?" A Systematic Review". Nutrients. 10 (4): 477. doi:10.3390/nu10040477. PMC 5946262. PMID 29649120. ^ Davis, Caroline (2010). "Attention-deficit/Hyperactivity Disorder: Associations with Overeating and Obesity". Current Psychiatry Reports. 12 (5): 389–95. doi:10.1007/s11920-010-0133-7. PMID 20632134. ^ Visram, S; Cheetham, M; Riby, D. M; Crossley, S. J; Lake, A. A (2016). "Consumption of energy drinks by children and young people: A rapid review examining evidence of physical effects and consumer attitudes". BMJ Open. 6 (10): e010380. doi:10.1136/bmjopen-2015-010380. PMC 5073652. PMID 27855083. ^ Moynihan, P. J; Kelly, S. A (2014). "Effect on Caries of Restricting Sugars Intake: Systematic Review to Inform WHO Guidelines". Journal of Dental Research. 93 (1): 8–18. doi:10.1177/0022034513508954. PMC 3872848. PMID 24323509. ^ Marriott BP, Olsho L, Hadden L, Connor P (2010). "Intake of added sugars and selected nutrients in the United States, National Health and Nutrition Examination Survey (NHANES) 2003–2006". Crit Rev Food Sci Nutr. 50 (3): 228–58. doi:10.1080/10408391003626223. PMID 20301013. ^ World Health Organization (2015). Guideline. Sugars intake for adults and children (PDF) (Report). Geneva: WHO Press. ISBN 978-92-4-154902-8. ^ Lakhan, Shaheen E. & Annette Kirchgessner (2013). "The emerging role of dietary fructose in obesity and cognitive decline". Nutrition Journal. 12 (1): 114. doi:10.1186/1475-2891-12-114. PMC 3751294. PMID 23924506. ^ Chiavaroli, Laura; Vanessa Ha; Russell J. de Souza; Cyril W. C. Kendall & John L. Sievenpiper (2014). "Fructose in obesity and cognitive decline: is it the fructose or the excess energy?". Nutrition Journal. 13 (1): 27. doi:10.1186/1475-2891-13-27. PMC 3987663. PMID 24666585. ^ What We Eat In America, NHANES 2013–2014. ^ "Measurement & conversion charts". Domino Sugar. 2011. Archived from the original on October 3, 2014. ^ "Engineering Resources – Bulk Density Chart". Powder and Bulk. Archived from the original on 2002-10-27. Wikimedia Commons has media related to Sugars. Look up sugar in Wiktionary, the free dictionary. Adas, Michael (2001). Agricultural and Pastoral Societies in Ancient and Classical History. Temple University Press. ISBN 978-1-56639-832-9. OCLC 44493265. Hannah, A.C. (1996). The International Sugar Trade. Cambridge: Woodhead. ISBN 978-1-85573-069-4. Hugill, Anthony (1978). Sugar And All That. Gentry Books. ISBN 978-0-85614-048-8. James, Glyn (2004). Sugarcane. Blackwell Publishing. ISBN 978-0-632-05476-3. OCLC 51837990. Saulo, Aurora A. (March 2005). "Sugars and Sweeteners in Foods" (PDF). College of Tropical Agriculture and Human Resources. Taubes, Gary (April 13, 2011). "Is sugar toxic?". New York Times.